Shipping is always free anywhere in the US. International shipping is also available, check for shipping costs during checkout. 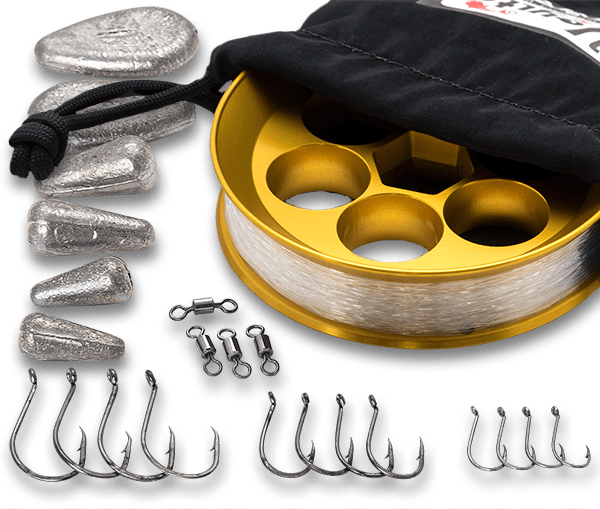 1x silky smooth and ultra-compact gold anodized aluminum Yoyito handline reel. 20 lbs or 30 lbs tournament grade monofilament fishing line. Available in clear, smoke blue, moss green, hi-viz green/yellow and hi-viz tangerine. 4x large circle hooks, 4x medium circle hooks, 4x small circle hooks. 2x 1 oz bank sinkers, 2x 1/2 oz bank sinkers, 2x 1/4 oz bank sinkers. 4x medium size barrel swivels. 1x user manual which explains how to use the reel and build basic rigs. 4x large octopus “J” hooks, 4x medium octopus “J” hooks, 4x small octopus “J” hooks. 2x 1 oz egg slip sinkers, 2x 1/2 oz egg slip sinkers, 2x 1/4 oz egg slip sinkers.